It is striking that this ancient story could still apply to information designers today. Although such designers are not creating pictures of grapes, like Zeuxis did, – they are making textual and visual information available through their interfaces – they still believe that the medium should disappear. For them, the ideal interface is a transparent window onto a world of data. The user is not supposed to notice the interface any more than the viewers of Zeuxis and Parrhasius noticed the paint on the surface. The user should look through the interface, just as the crows looked through and saw the grapes. It does not have to be this way however. Painters do not have to aim for transparency, and neither do digital designers. The desire for transparency is a cultural and historical choice. In the history of western painting and design, it is true that transparency has been the goal of most artists and designers. Japanese artist Sayuri Michima does not follow this trend. She even unmasks this aim for transparency of information designers with her artwork. How she does so, will be explained in this short text. The famous quote ‘the medium is the message’ by Marshall McLuhan from his book Understanding Media: The Extensions of Man (1964) literally means that the knowledge a medium conveys is bigger than the knowledge that is being conveyed through the medium. The experiences a medium evokes have a bigger impact on us than the experiences that are mediated by the medium. According to this view, the meaning of an artwork is largely embedded in the chosen medium. In the first place, the medium determines what information can be transmitted. Or rather, the information that is being transmitted through a medium tells more about the properties of the medium than about anything else. Secondly, the medium evokes a certain environment for both the sender and the receiver: a mental space or sphere of interest in which the users of a medium can understand each other because they share the same media preformed view. Anyone not connected to this view will have difficulty understanding the exact message. The other famous quote from McLuhan, ‘the medium is the massage’, refers to this phenomenon. It means that each medium massages its users to a mass, to a more or less unified group of users. As the user of a medium, you are always part of this mass. Some of these masses appear literally, like in the cinema or in the museum. In other media, like internet or television, the mass remains imaginary. The environment of these media raises an ‘obviousness’ for the users, a normality, a way of seeing. This obviousness of the medium ensures the medium that the information it conveys is being mediated transparently. That is, the medium provides a direct connection to the reality which appears through the medium. It does not draw attention to the medium itself. This phenomenon is called immediacy. The essence of digital media design is that it works on two levels: it mediates the content it wants to transmit, and it is also transparent. That means that you can see the computer screen as a window that opens up a new world that lies behind it. This is the world of information that the computer makes visible, such as texts and digital images. Due to the concentration of the user on the content, the obviousness of the medium, the interface is being forgotten and thus transparent. The medium provides a direct connection to a reality which appears to us through the medium and lets us forget the medium simultaneously. Just like when you watch a movie and you get absorbed into the story, so the monitor and the cinema where the film is being viewed gets forgotten. This transparency of the medium does not mean that the design of the medium does not matter. The form is inseparable from the content. There are also times when the user should look at the interface instead of look through it. Like when you want to enlarge a picture or open a new window. At such times, the interface is no longer a window but a mirror, which reflects the user and his relationship to the computer. This is called hypermediacy. Hypermediacy draws attention to the medium itself and emphasizes the autonomous value, the unique quality and novelty of the medium instead of the message. If we only look at the ‘other world’ through the interface, a huge part of the experience is being lost. The very fact that you have the illusion of a world behind this world, which the interface as a technical invention presents to us, gives a new layer of meaning. The same is true for film. When we see a film only as transparent, we get sucked into the story. When we take a step back and see how ingeniously the film is made in all its technical aspects, the experience of the film as a whole is being enriched. This is exactly the strategy Sayuri Michima uses in her digital artwork. The digital art of Sayuri Michima is openly hypermediate and self-referential; it takes as its content the medium on which the images themselves appear, namely Facebook. 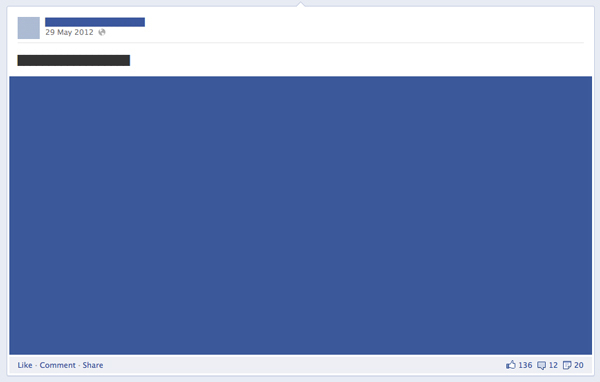 Michima uses the design of Facebook as its visual means. 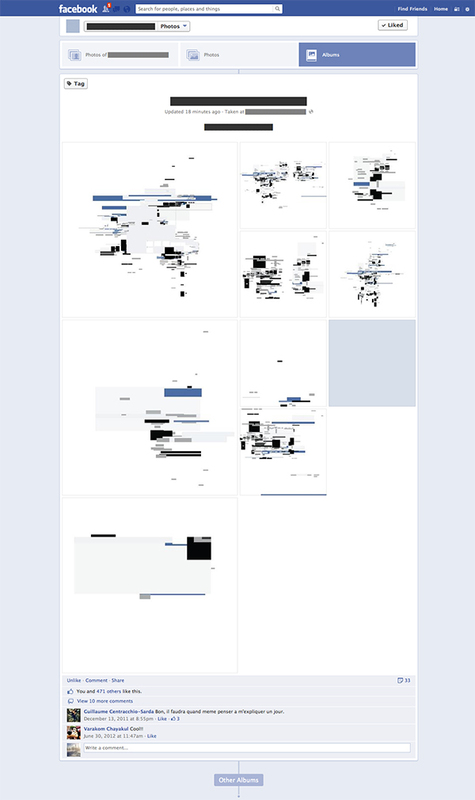 The rectangular shapes, the (corporate) colors – black, white and different shades of grey and blue -, all refer to Facebook. The social medium clearly is the visual source of inspiration, like an appropriation of ‘low culture’ into ‘high art’. Thus, Michima emphasizes that the boundaries between digital information and fine art are malleable. 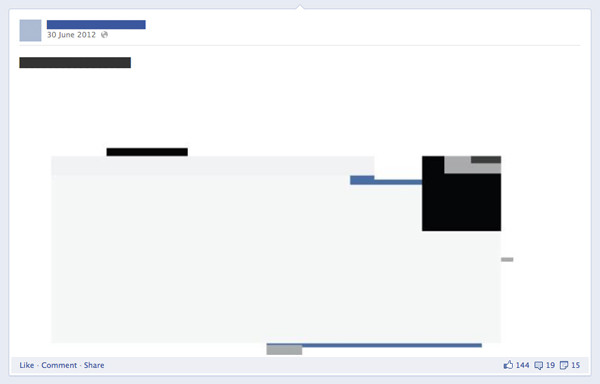 The design of Facebook is beautiful and is also there to be noticed, Michima seems to say. In this way, her artwork does not suggest that we forget the medium, but rather that we enjoy the medium or process as an experience. Not that we look through the experience to a world beyond, like we are used to do, but rather that we look right at the surface. It challenges the assumption of the strategy of transparency of Facebook and enriches the experience of the artwork and the medium as a whole. Sayuri Michima also uses Facebook as a tool to define the shape of her art on display. The web design of Facebook as an exhibition platform determines things like the size and placement of the images and the file compression. These can be seen as restrictions of the medium. But Michima also takes matters into her own hands, like a pun on the restrictions of Facebook. A good example of this can be seen in the fact that she almost doesn’t use language on her page, but instead posts color blocks, like if her words and sentences were censored by Facebook. Interesting to know is that Michima’s personal account was once blocked by the people behind social medium, for no reason. So, her erasure of language constitutes as a kind of self-censorship and also makes her page into a piece of art in itself. By this self-censorship, Michima claims the freedom to transform her social identity. In this way, she plays a role in visualizing power relationships and disrupting subliminal daily routines of social media usage, by deconstructing the familiar and facilitating an alternative lens to understand, and maybe even critique, these mass media. Facebook has taken over a large part of our communication, and as you now know, the experiences the medium evokes have a bigger impact on us than the experiences that are mediated by the medium. Unfortunately, many people do not reflect on the effect this has on our world. Luckily, Sayuri Michima does, and does so through hypermediacy and an aesthetically pleasing body of work.